Based in Michigan, Jeremy Morris has released 40 albums under his name, including collaborations, in just over 30 years. A unique talent, Jeremy's music falls into a variety of categories - Beatles inspired power-pop, spacey psychedelic progressive rock, solo piano, solo guitar, and 'praise & worship'. Each album focuses on one of those themes, and while some listeners may find the stylistic gamut a bit too dispersed, having immersed myself in a pile of Jeremy albums from the past few years I found myself quickly tuning into what really all comes together to comprise a fascinating and enlightening Jeremy whole. Aural Innovations readers are sure to be enamored of two of Jeremy's 2008 albums - Glow In The Dark and Mystery and Illusion. Glow In The Dark is an instrumental album that is characterized by classic progressive rock with a decidedly cosmic edge, and includes some of the most mind-boggling guitar work I've heard from Jeremy yet. Prog that will sweep you off your feet, but this sucker ROCKS too! Mystery and Illusion rocks even hard, has equally stunning guitar pyrotechnics, is deep in prog rock territory, but is a prog-psych take on Jeremy's Beatle-esque power-pop side. Together these are two of the best albums I've heard this year. Other standouts among the sampling of albums Jeremy sent include the 2002 release, Kingdom Come. Jeremy's Steve Hackett and Anthony Phillips influences are all over this album, but Jeremy takes that brand of progressive rock deeper into much welcome spacey territory, with nods to Tangerine Dream and the like. Just check out the mind-bending 35 minute title track and you'll hear what I mean. But Jeremy is also a master of the pop song… in composition, production and performance. The Beatles are one of his clearest influences, particularly John Lennon, though early Kinks, The Who and even The Monkees have clearly left their mark. Fans of 60s/70s power-pop and pop-psych will surely love these songs. Albums like Lost and Found and the aptly titled Pop Dreams, showcase Jeremy's flair for pop proficiency. Jeremy nails the sound of his heroes on the Beatles tribute album of cover songs, Yesterday, Today and Forever, though the 11 minute original number, "Revolution #7", is as freaky as the freakiest music the Beatles ever recorded. King of Kings, Lord of Lords and Faithful and True are three of Jeremy's Christian "praise & worship" albums. And while lyrically these are exactly what you would expect from such a categorization, many of the songs falls firmly into the well crafted pop song mold that Jeremy is a veteran master of. Jeremy has also released several solo piano albums, three of which I've heard (Rays of Hope, Home in the Sky and Fruit Tree). The music is beautiful but I didn't find myself coming back for subsequent spins. Much more to my liking were the solo acoustic guitar albums, Still Waters and New Day Rising, which covered a range from Leo Kottke stylings to music that brought to mind Anthony Phillips' Private Parts & Pieces series. Jeremy's albums are released on a variety of labels around the world, as well as his own long running Jam Recordings label. In addition to his own music, Jeremy also releases CDs by other bands on Jam Recording, nearly all of whom fall firmly in the 60s/70s influenced power-pop mold. And boy, what a knack he has for finding good bands! Among the great Jam artists Jeremy shared with me is the raw, early Who/Syd-era Floyd/psychedelic Beatles garage-pop rock of The Ringles. Similar influences can be heard in the progressive-pop of Third Of Never, whose Moodring CD includes keyboard contributions from long time Who keyboardist John "Rabbit" Bundrick (their Who influences are further revealed with a potent cover of PeteTownshend's "Let My Love Open The Door"). Fans of 60s styled jangly psychy pop songs will surely dig The Lolas. How can you not love a band who write songs about spending a night listening to T. Rex with Barbara Stanwyck and cover the Sweet's "Wig Wam Bam"? More overtly 60s sounding is Raquel's Boys, who bring to mind a range of influences from the Byrds to the Turtles. Spinning Jennies are equally as power-pop as any Jam artist, but have a more modern harder rocking sound. One of my favorites from the Jam Recordings stable of artists has to be Ed James. Right in line with the power-pop of the other bands on the label, Ed is more 70s than 60s influenced, and I agree with the Jellyfish reference on the Jam web site. And if writing cheesy lyrics is a true art form, you'll fall hard for his "Star Trek Girl", with verses like My Staaaaar Trek girl… take me on a 5 year mission… where no man has gone before. And Take your phaser off stun baby, it's your world I want to explore. A bit different from the rest is Glowfriends, comprised in part of Jeremy's daughter, son and daughter and daughter-in-law, who play music that is somber, drifting, and even seductive. Two of the many artists referenced on the Jam site as influences are Sigur Ros and Nick Drake, and the blending of those two strike me as a good analogy. Some of the songs are like an ambient brand of folk music. Very interesting band. Aural Innovations (AI): When did you first start playing music and what inspired you to begin? Jeremy Morris (JM): I started playing music at age six when I first took piano lessons. The Beatles were a real inspiration at that time. AI: Were you ever in bands? If so, what kind of music were you playing? JM: I had my first professional working band at age 15 in 1973. The band was called Full Moon. By now I was playing guitar. We were playing the Beatles, Stones, Led Zeppelin, Black Sabbath, Deep Purple, Jethro Tull, Aerosmith, Allman Brothers, Doobie Brothers, Mountain, etc, plus our own originals. AI: You have an extensive discography. When did you start releasing albums? JM: I started putting out limited edition cassettes in the 70s, and then by the early 80s started pressing vinyl. Then it went on to the CDs in the 90s, etc. AI: Was it always as Jeremy? JM: When it comes to the recordings, it was always as Jeremy. The bands I played in were mainly cover bands until the 90s when I decided it was high time to start playing my own music as the main thing. AI: You release progressive rock albums, 60s/70s inspired power-psych-pop albums, solo acoustic guitar albums, solo piano albums, "praise & worship" albums... what inspires all this variety? What inspires the release of a prog album vs. a pop-psych album vs. a praise & worship album etc etc? JM: I have always enjoyed a wide variety of music. So I would get really bored if every album was the same style. I just record whatever comes out and go with it. So it's not uncommon for me to be working on 5 different albums all at the same time. I am not confined in my expression this way. AI: You're obviously a huge Beatles fan. Perhaps even above all else. What is it about the Beatles? JM: I think they are one of the few bands who were also willing to experiment and try just about anything. That's what I like about them. So when someone says "sounds like the Beatles…", that could be just about anything from "Revolution #9" to "I Wanna Hold Your Hand". AI: Another very common analogy is Steve Hackett and Anthony Phillips. Are they your main guitar inspirations? JM: The big four for me are: Anthony Phillips, Steve Hackett, Gordon Giltrap, and Joe Satriani… when it comes to favorite guitarists. I have had the pleasure of going to Anthony Phillips house, eating dinner with him, and spending some time talking music with him. I hope to meet these other guitarists as well. For whatever reason, these musicians connect with me in a big way when it comes to musical expression. AI: Your two most recent albums - "Mystery & Illusion" and "Glow in the Dark" - have some of the most ripping electric guitar work I've heard from you, and between them have some amazing full blown psychedelic, prog and spacey music. JM: Thanks… I am starting to cut loose more in the studio now. That's my live side coming through on the recordings. As time goes on, I find my recordings are becoming more and more live sounding. In fact, albums like Still Waters, New Day Rising, Fruit Tree, etc… are all live in the studio recordings. I try to catch the performance on the first take whenever possible. It's like capturing a good photo. AI: Scattered about your many Jeremy albums are several collaborations. Jeremy & Progressor and the Guill & Jem duo albums are the ones I'm most familiar with. How do decide to do these collaborations, or is it as simple as really connecting with another artist and wanting to work together. JM: It's a connection that sparks these albums into being. I just finished a new collaboration with two musicians: Jon Dawson, and John 'Rabbit' Bundrick. Jon is a member of the prog band Third Of Never. John 'Rabbit' Bundrick is The Who's keyboardist since 1981. He's played on the Free albums, with David Gilmore, and a ton of other bands. It's been really fun recording with these guys. The band of the three of us is called Electric Forgiveness. The album should be released before the end of the year. Along with that a new Guill and Jem album, "Two Seconds", will be released this month! AI: When did you begin your Jam Recordings label and how did it come about? JM: The label started pressing vinyl in 1984. The first album, Jeremy Morris "ALIVE", was a pressing of 5000 copies. It's being released now finally on CD nearly 25 years later. AI: You still release albums on other labels. Do you always initially try to get a new album on another label? JM: If I feel that a label specializes in a certain music… like Kinesis or Mals who do the progressive stuff, I will usually work with that label. The Astral label is great for freaky, spacey music. If I am releasing a power pop album, that usually comes out on Jam. AI: Pretty much all the other Jam Recordings label bands I've heard have been 60s/70s influenced power-pop bands. Incredibly good ones at that. Other than your own stylistic variety, are you intentionally focused on these pop bands for the Jam label? What is the criteria for a bringing other bands on to the label? JM: Jam has been quite well regarded as a power pop label for some time now. The label is expanding more now into other areas. This month we are releasing the first "Shoegaze Rock Compilation", Just Like A Daydream. I am keeping the door open to releasing anything I feel should come out, as the spirit moves me! I am not restricted to any style. AI: Do you find that your fans tend to latch on to a particular style? That is, do you have Jeremy prog fans, Jeremy pop fans, Jeremy praise & worship fans, etc etc? JM: Some fans tend to latch on to certain styles (wishing I would do only one style), but the true Jeremy fans like everything I do because they understand that doing "many styles" is my style. This is what keeps the creative force alive and well. AI: Are you a full-time musician? If so, how do you manage doing that in the indie world? JM: I am a full time musician. I manage that by doing a variety of music related things. Having a record label, internet store, mail order, recording studio, playing live, doing my own booking, giving music lessons, etc… everything works together. AI: I'm sure it's never been easy but it seems harder than ever now to run an independent label. Are CD sales holding up? Are you feeling any pressure to do digital download sales? JM: CD sales are holding up! I am selling more CDs this year than in previous years. I am not a big fan of downloads. I prefer music as a complete package, lyrics, artwork, etc. AI: You did a European tour in June. Tell me about that. Did you have a band together? Which Jeremy style of music was represented on the tour? JM: The first part of the tour was in England. The band played at the Cavern Club (home of the Beatles) several times. We played the power pop stuff for that. Then it was on to Spain, Portugal and France. Here I was busy doing some recording, radio and television shows, and performing. I spent time with my good friend Guillermo Cazenave, who runs the Astral label and is a great musician. AI: Do you play live often? Local, nationally, overseas, all? JM: Yes, in fact I am going with the band after this interview to do a California west coast tour. I have played Los Angeles, Hollywood, San Francisco, San Diego, New York, Chicago, Boston, Nashville, Chapel Hill, Philadelphia, Atlanta, Detroit, etc. And then of course different parts of Europe. AI: Any upcoming news, projects, or events we should know about? JM: At some point I plan to release a Jeremy "Box Set", but it's not quite time yet. 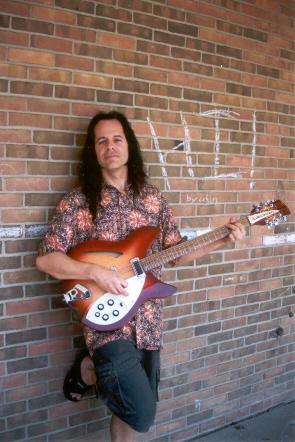 I am working on many new albums… prog, power pop, praise and worship, classical, etc. I will keep recording and performing and doing this as long as I am meant to. I was born to do this. I am very thankful that God has blessed me with the opportunity to make music and bring pleasure to others.